Currently, there are two major issues that are affecting my cooking. The first is time, or more specifically, the lack there of, and the second issue is the rising cost of food. Let me tackle these one at a time. My wife and I had our first child (a lovely daughter) in Fall 2006. By Spring 2007 we had adjusted nicely to having a little person in our midst. I was planning meals and shopping and prepping on the weekend and with little to no real change on my part (other than moving dinnertime up an hour to 5:00). I estimated that I had about 1 hour less to cook and blog on a daily basis, so naturally, I felt that when we had a second child, I could expect a similar reduction in time. 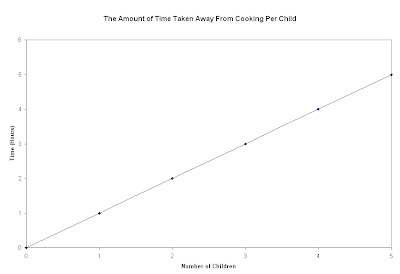 Naively, I expected the relationship between children and time to cook to be a linear one. My wife and I had our second child (a handsome son) two weeks ago, and I've already reassessed my graph (I'm a science teacher, so naturally I love graphs). 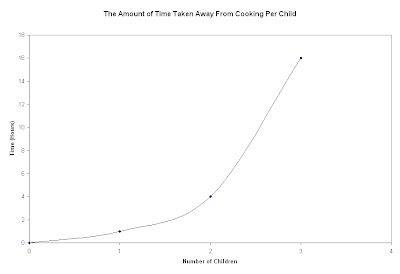 Unfortunately for my cooking and blogging, the relationship seems to be more of the exponential variety. So instead of 2 less hours per day to cook and blog, It now seems it will be more like 4 hours less. Don't get me wrong, it's not like I need 4 hours to cook dinner on a daily basis, but I enjoy a leisurely pace when I cook. What does this all mean? Well, since I won't have quite as much time to spend preparing meals, I need to get faster, or find some quicker recipes for those especially tricky nights, or a little bit of both. That brings me to food prices, which are increasing all over the world. Some basic population ecology applies here. In regards to populations, food is what we call a density dependent resource. Since food production is relatively constant at this point in human history and most arable land is in use, competition for food increases as population increases. In other words, the more members of the population, the harder it is to feed everybody. Well, take a look at what has happened to the world human population over the last 58 years (and projected over the next 42). More people means more food, and with most of our productive land maxed out, and things like the unpredictability of climate affecting farm yields, our world food supply is perilously thin. Food prices would naturally increase as the population growth out paces production anyway, but it looks even worse due to the relatively recent phenomenon of cheap food. The Green Revolution allowed humans to produce more food than ever before, which drove down prices, enabling rapid population growth. Unfortunately, many of the advances of the Green Revolution (such as heavy use of pesticides and petroleum-based fertilizers) are unsustainable. What does it all mean? Basically, the methods by which we cheaply produce mass quantities of food are totally unsustainable and as we revert/convert to other methods of production, there will be inevitable price increases. Yet the world has gotten used to cheap food over the last 60 years, and now access to cheap food is viewed as a natural born right by most, especially Americans (along with cheap energy, cheap water, cheap products, etc.). Well, it appears that the long era of cheap food is over. A major shift in thought along with a deep examination of needs versus wants seems to be in the cards for the human species. So I have been trying to stock my pantry and come up with some new, quicker meals that might save me a little money as well. An excellent choice to address both of these issues is beans. Beans are a relatively cheap source of protein (especially if you buy them dried, and the soaking is all hands off time) that can be combined with whole grains to provide extremely healthy, fast meals that feature complete proteins. 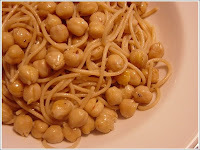 We really like chick peas at my house, so this recipe for linguine with chickpeas and parmesan, with just 5 ingredients and 5 minutes of prep time is a real winner. Put a pot of water on to boil. When the water is boiling, add some salt and heat a few tablespoons of olive oil in a large skillet. Toss the spaghetti in the boiling water and cook until al dente. When the oil is shimmering, add the chickpeas and the crushed red pepper, and toss frequently. Before you drain the spaghetti, reserve 1/3 cup of the pasta water and add it to the chickpeas. Simmer until the water is just about all evaporated then add the drained pasta and toss to combine everything. Stir in the Parmigiano and remove the pan from the heat. I like to use Parmigiano-Reggiano (the undisputed king of cheese according to Mario Batali), but it is pretty expensive, so a domestic parmesan cheese is an acceptable alternative in the spirit of thrift (and reducing food miles). Add some black pepper, a little salt, and a little more olive oil. Toss everything together and serve. Increase the amount of crushed red pepper for a little more kick, or maybe add a minced garlic clove or two with the chick peas for a slightly different take. This dish comes together extremely quickly, and is composed entirely of pantry items, so stock up when the sales are good, and cut back on the weekly grocery bill. This dish is my second submission to Presto Pasta Nights, a site originally dreamed up by Ruth of Once Upon a Feast, who is again playing host this week. 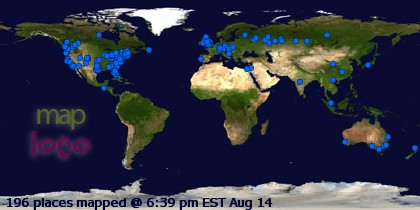 Be sure to check the site on Friday, July 4th for this week's roundup! Thanks for sharing your quick and cost effective dish with Presto Pasta Nights. I am very much intrigued by this dish. I would love to try this: thanks for sharing!